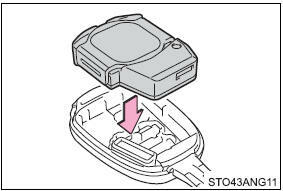 Replace the battery with a new one if it is depleted. Remove the cover. 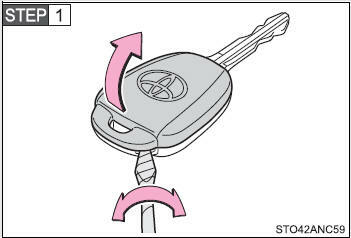 To prevent damage to the key, cover the tip of the screwdriver with a tape. Open the case cover using a coin protected with tape etc. and remove the depleted battery. Insert a new battery with the “+” terminal facing up. 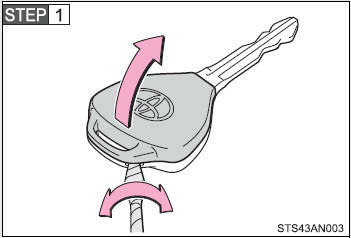 To prevent damage to the key, cover the tip of the screwdriver with a tape. 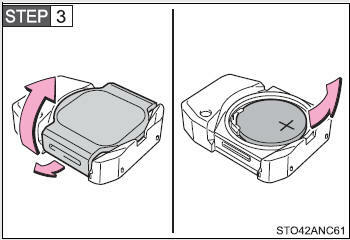 To prevent the buttons from being disassembled, face the button surface downward. 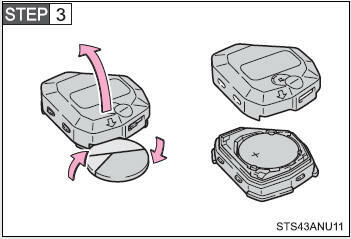 Open the case cover and remove the depleted battery. ●Batteries can be purchased at your Toyota dealer, local electrical appliance shops or camera stores. ●Replace only with the same or equivalent type recommended by the manufacturer. ●Dispose of used batteries according to local laws. ●The wireless remote control will not function properly. ●The operational range will be reduced. Replace the module from right above. 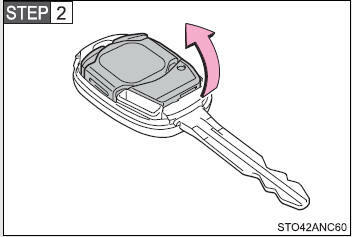 Replacing it from diagonally above may prevent the key buttons from operating properly. These parts are small and if swallowed by a child, they can cause choking. Keep away from children. Failure to do so could result in death or serious injury. ●Always work with dry hands. Moisture may cause the battery to rust. ●Do not touch or move any other components inside the remote control. 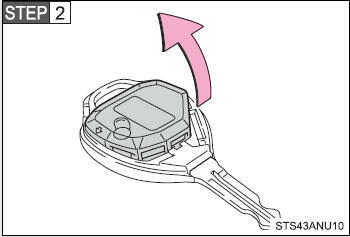 ●Do not bend either of the battery terminals.